We are back with our 20th update. We welcome all our new Companists and thank you for your investment and trust in our business. We are amazed at how much positive news we have received from you and the success of our equity crowdfunding campaign. This makes us particularly proud and motivates us to continue giving it our all. Today’s update is from our Head of Marketing, Alex, and will cover Instagram as a means to build KoRo’s brand and as a sales channel. We have already published several updates concerning influencer marketing. Today’s update will focus explicitly on our Instagram profile and how we use it for our success. Let’s start at the beginning. Why is Instagram so important to us? Not everyone may know this, but Facebook changed its algorithm around a year ago with the result that so-called business profiles (such as our Facebook page) have been disappearing from users’ feeds more and more. We were immediately faced with the following question: How can our brand get back there? The answer became clear quickly: We have to spend money! In marketing, it is often said that “organic reach on Facebook is dead.” Because of this change, Instagram has entered the game! There, brands like us have the opportunity to reach our followers without paying money and to use hashtags to gain new followers and potential customers, for example if they look for #pancakes! 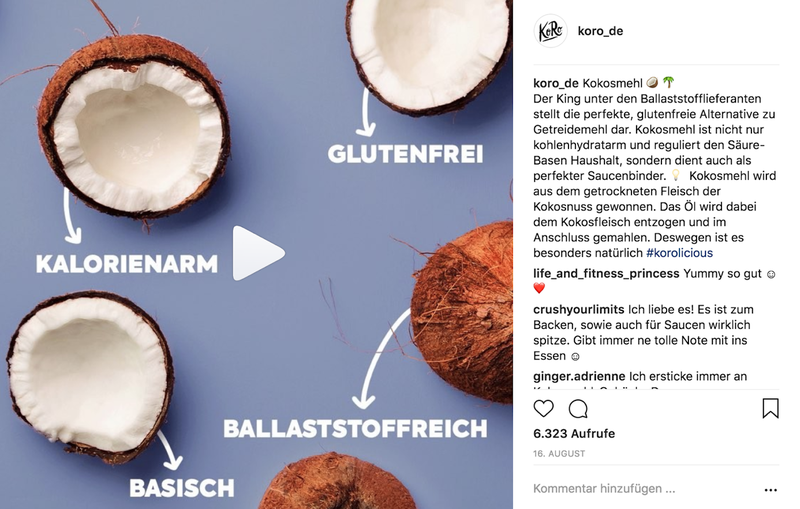 What options does a brand like KoRo have on Instagram to contact customers/followers? A single story can consist of different elements: One can use photos, 15-second videos, and boomerangs. The uploaded photos and videos disappear automatically after 24 hours or can be saved as a highlight. How do we use stories? For us, the primary task of stories is to make KoRo tangible to our customers. For example, we introduce the team, explain the processes behind the scenes and also use available functions (e.g. surveys) to receive quick feedback from our followers. Like on Facebook, a post is a picture or video that you share with your followers on your profile or feed. Different from Facebook, Instagram attaches great importance to the use of hashtags. For example, there are more than 8 million images on Instagram for the hashtag #pancakes. The user can use hashtags to find interesting posts and discover new profiles. How do we use posts? We also present new products to our 37.5k followers in the form of sweepstakes or promotions in the shop. The idea behind the concept is that we offer our community a variety of benefits. Each individual follower can thus save money, acquire unique product knowledge, and can also win products. As with Facebook or any other social network, you can write direct messages to any user on Instagram. This allows for a simple and direct exchange between customer and brand. How do we use direct messages? It is worth mentioning that we receive 20 to 40 messages from our followers daily, with questions about products and questions about our principles. This medium is an ideal tool for us to exchange information with our followers and also greatly helps us to understand our customers. We are in close communication and constantly encounter new challenges and new product requests. My team and I use Instagram's messaging feature proactively, especially when a customer has posted a post with our products. (A marker indicates this) We ask for feedback and if everything was satisfactory to the person. Instagram TV (IGTV) was launched in June 2018. Using IGTV, it is possible to upload videos with a duration of up to one hour. Instead of the conventional 16:9 format, it uses the 9:16 format. If you have the app, you'll notice that you'll suddenly see a small TV in the upper right corner. How do we use IGTV? As a brand, we are one of the first users of IGTV. We use it mostly to publish our video content about our products here and not only on YouTube because our customers and a large share of the target group already spend their time on the Instagram app - why shouldn't we use this opportunity and make the most out of the attention of users there? For us, Instagram is more than a platform for likes, followers, and comments! It is a medium that allows us to be closer to our customers, to receive wishes, and to work on creating outstanding products together: We collaboratively shape the future of KoRo by communicating with one another and gaining unique insights from the behavior of our customers. We want to differentiate ourselves from others as a brand and place our focus on the use of our products. After all, people buy foods in order to cook or bake with them, or simply because they want to snack on something extraordinary. If, for example, one re-discovers one’s favorite childhood dish, this stirs up emotions that one wants to recreate. We aim to activate these triggers with our posts, which we create together with our influencers. Additionally we sort our newsfeed. This means: If you go to the profile koro_de, you will see a sorted list of different areas that allow the user to discover the many possibilities that the assortment of KoRo offers. As of 28.08.2018, we have 37,563 subscribers on the German KoRo account. Every week, more than 7,000 users access our profile and 1,410 people visit our shop via the link in our description (picture attached). Since 5 June, we have gained over 1,600 new subscribers to koro_de with a growth rate of just over 4%. As you can see in the excerpt from Google Analytics, we were able to attract over 3,000 first-time visitors to www.korodrogerie.de through our activities on Instagram in August. These have generated revenues of EUR 4,500. I hope this update was a good insight into our activities.